I’ve been hiking with my friend Daniel, almost yearly, for a long time. Today (Friday) is always a special day on our treks. Since sunset marks the beginning of the Sabbath and a layover day with a two-night camp, it always comes with a great deal of anticipation to see where we end up. Today we had no idea where we’d settle in for the Sabbath, and that was exciting to me – I was eager to see how the day would unfold. We left our island paradise at Thousand Island Lake around noon after enjoying the morning sun, and writing, reading, and fishing for the lake’s healthy and hungry rainbow trout. Not long after the leaving the island, I saw a movement on the ground on the western lakeshore of the big ocean: a frog! It was exactly as the Frog Man described and in the exact spot where he said to look. It made me feel like Frog Man Jr., and I hope to write him when I get home to tell him about my encounter. A beautiful walk through lakeside meadows, hemlocks, and tundra took us up the drainage leading to Glacier Lake Pass (i.e., North Glacier Pass). We met a grandpa napping behind a giant boulder, having a great time while waiting for his son and grandson to return from their scramble to the col. It was neat to see three generations traipsing through these mountains together, and it reminded me of fond memories of fishing and camping with my dad, brother, and grandfather on the Chehalis River in Washington when I was a kid. Shortly after our encounter with Gramps, we met up with a hen grouse and her three chicks. She clucked sweetly at them, and kept them close. We miss mom. Eventually we arrived at the col at close to 11,000 feet on the Sierra Crest, and due to the gale, promptly began a diagonal descent towards Catherine Lake’s north shore. We stopped for a break in a tiny patch of grass (the only patch of grass to be found at this altitude) at the outlet to eat, drink, and fish. 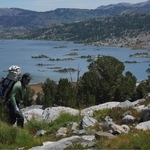 From this vantage point, the wilderness traveler enjoys what may be one of the finest vistas in all of the High Sierra: a deep, dark blue lake enshrined in a temple of glaciated high peaks featuring the domineering northwest face of Mount Ritter. We spent a bit of time here taking it all in, and by the time we had our fill, the late afternoon sun reminded us that we had best start looking for a camp, which would pose no small challenge in this environment of rock and water. We spent a fair bit of time scouting almost the entirety of the Ritter Lakes basin, which offers so little in the way of camp comfort but so much in the way of scenic drama. After a circuitous scramble through the basin, I finally stumbled upon a grassy oasis in a bench overlooking one of the unnamed Ritter Lakes, the perfect place for a Sabbath layover: stunning scenery and off the grid. Our camp feels like it’s at the end of the world – we just came through dramatic mountains, which are behind us, and we are looking down on a lake with its far shoreline protected by steep cliffs that plunge to a massive valley 1,500 feet below. We cannot see the valley, of course, so it looks like the edge of the flat earth has been reached. Daniel is pitched on a flat tundra bench, and Chase is perched in a small bit of grass hidden between two massive boulders at the top of a cliff plunging to the lake below. I’m opting for a Louis L’Amour style of camp, far back from the lake at the base of a rock wall, in a tiny patch of tundra. A scramble is required to reach my camp, which should keep the visitors down while I exercise my introversion. My stone grey Cuben Fiber shelter blends in with the cliff, and it’s as stealth as you can get in the alpine while preserving a view of everything below. Tonight we celebrated the Sabbath with fried pasta and an Israeli Pinot noir and the joy of knowing that not only are we encamped at one of the remotest spots in the High Sierra, but that we’re in a hidden tundra oasis that few travelers of even the Sierra High Route will ever experience. This is a special spot. – Daniel trekking up towards Glacier Lake Pass, Thousand Island Lake in the background. 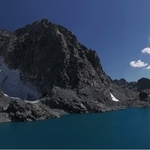 – Panoramic of the scene from our rest break at Catherine Lake, with Mount Ritter and the Ritter Glacier. 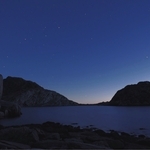 – Nighttime scene from our camp in the Ritter Lakes basin, looking towards the west, where cliffs below the lake drop 1,500′ into the headwaters of the San Joaquin River.